In Beaverton, Oregon, cache owner jewilk1 and his son OmNom! 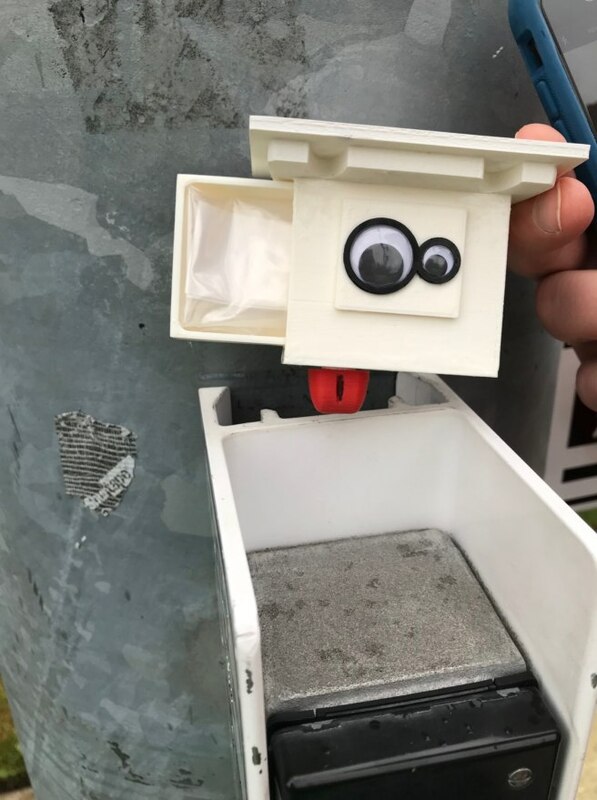 create fun hides by using a 3D printer, puzzle logic, and googly eyes. 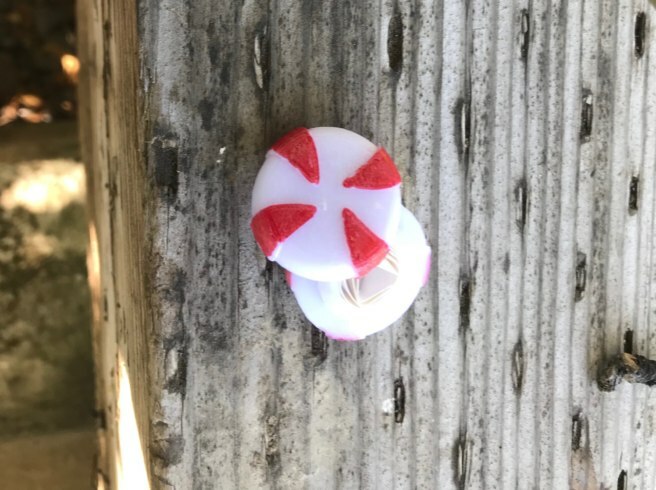 You may recognize the name from this week’s Geocache of the Week. 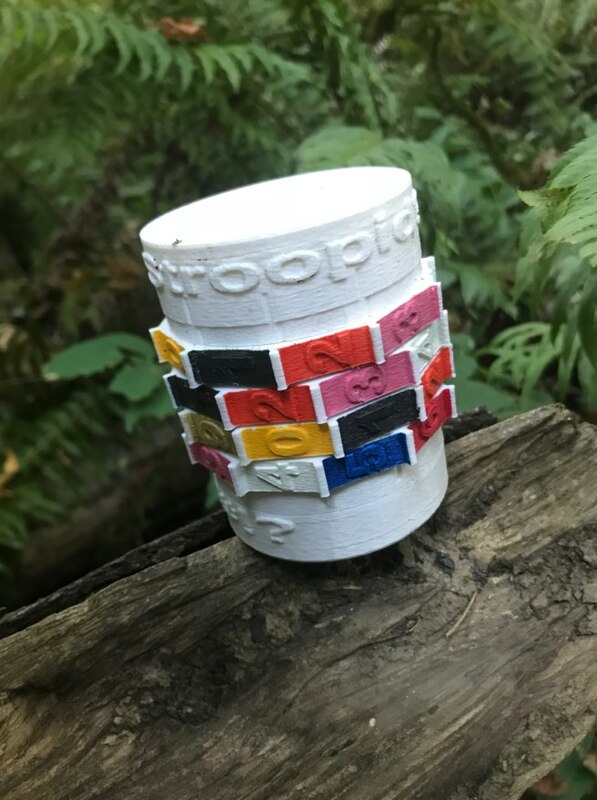 They are examples of creative freedom in the geocaching world because they make both a simple cache and a puzzling cache memorable. After 7 years of caching, 60 hides, and 6,700 finds, jewilk1 continues to add a unique touch or a new level of deception into their cache creations. Some of their puzzle caches have knobs, codes, and keywords to search for on the back of books that help make their hides so interesting. The hobby has led us to places we would never have experienced, such as The Tomb of the Unknown Soldier of the American Revolution or the view of Tillamook Rock Lighthouse. Likewise, it is hard not to smile after a fellow geocacher relates a positive story about finding a geocache which you designed and introduced to the game. These smiles have inspired us to continue to create unique cache designs and become a better designers. 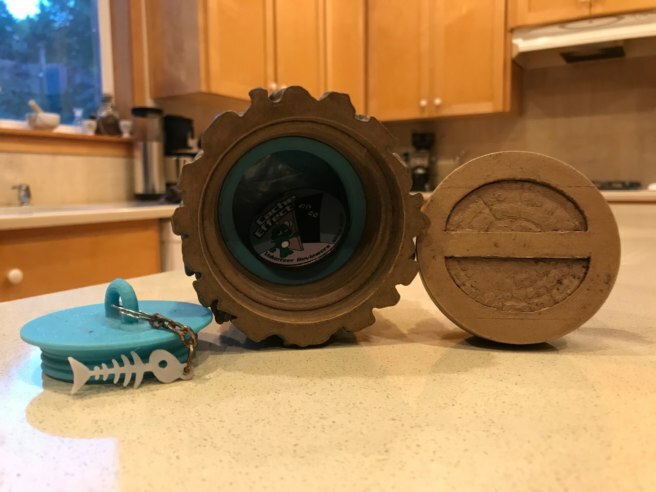 We wanted to know more about their creative process, what got them interested in geocaching, and what makes for a quality hide so we interviewed jewilk1 to get the inside scoop. Geocaching HQ: What’s your background outside of geocaching? Jewilk1: I’ve spent most of my time outside of geocaching trying to get my son to do his homework. I started work in Beaverton, Oregon, as a ceramics engineer but later transitioned into winemaking. Geocaching HQ: How and when did you hear about geocaching? Jewilk1: I first learned about geocaching from a coworker. He had gone hiking with a friend from Germany who was active in the hobby. He showed me a small glass trinket that he found in one of the caches near Bend, Oregon. I thought the idea of a global treasure hunt was interesting, so I did a little research online and discovered the website. From that point, I grabbed my son and starting searching for some of the local geocaches in the Beaverton area. Geocaching HQ: Which cache got you hooked? Jewilk1: One local cache, GC2T7YA, 108.5, really impressed us with its camouflage. This cache was one of the first caches that really mimicked its surrounding. Plus, it has plenty of room for swag and travel bugs. Being big travel bug fans, this cache is where we left our own first traveler. Geocaching HQ: What is the story behind your username? Jewilk1: Ha! I can proudly say my username has no story. I signed up prior to understanding that there was an entire caching community and that the username would become some sort of identity. The name is simply based on my wife’s and my initials. 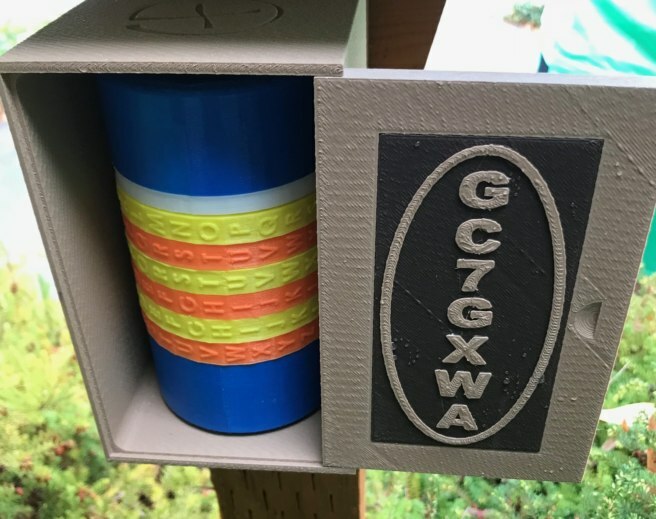 Although I don’t have people calling me some cool moniker like “GloryDog.” I do get enjoyment observing other geocachers try to pronounce the unpronounceable jewilk1. My son’s username originates from a popular gaming app. Geocaching HQ: What is your favorite cache(s) you’ve found? Jewilk1: Humpty Stumpty (GC7PWZN) is a great example of perfect camouflage and the use of red herrings. Bee Mine (GC4KW3F) is a nice example of starting with an idea and maintaining the concept from cache page to container. Geocaching HQ: For you, what makes a quality cache? Jewilk1: To me, a quality cache should have at least one of the following components: a special or unique location, a very creative hide, or a fun story. The best caches weave all three components together. Geocaching HQ: What’s the best approach to creating a geocache? Jewilk1: Create geocaches like you would write a story. Use the cache description to introduce geocachers to the story. Identify a location or puzzle that can be used to build a plot. Finally, provide an interesting geocache as a resolution to the story. Geocaching HQ: If someone reading this was looking for inspiration, what words of advice would you give them? Jewilk1: Look for inspiration outside of geocaching. Everyone has a unique knowledge base and personal story. Find a subject you are familiar with and insert that knowledge into geocaching. Whether it involves a puzzle or some type of container, an individual’s unique knowledge base will bring something new and unexpected to the game. Geocaching HQ: You have a number of complicated and intricate caches. Do you find it difficult to provide maintenance on them? Jewilk1: Since most of our caches are designed and built using a 3D printer, we are able to recreate caches relatively quickly. However, we usually spend some time trying to learn why a cache may have not operated correctly or gone missing. Our goal is to replace a cache with an improved version of the original hide. Geocaching HQ: Have you ever had an idea that you thought was impossible? Jewilk1: No. We only have ideas that we don’t know how to implement… yet. Geocaching HQ: Do you have a favorite hide of your own active caches? Jewilk1: We like the idea of caches having a tactile component. So many of our hides involve operating a gadget in order to retrieve a log. One of our favorites is @#!? This: The Field (GC6HV7X). The cache is part of a series of puzzle boxes and gadget caches we have created for my son’s account. The cache contains only a lock, small log, and a screen. 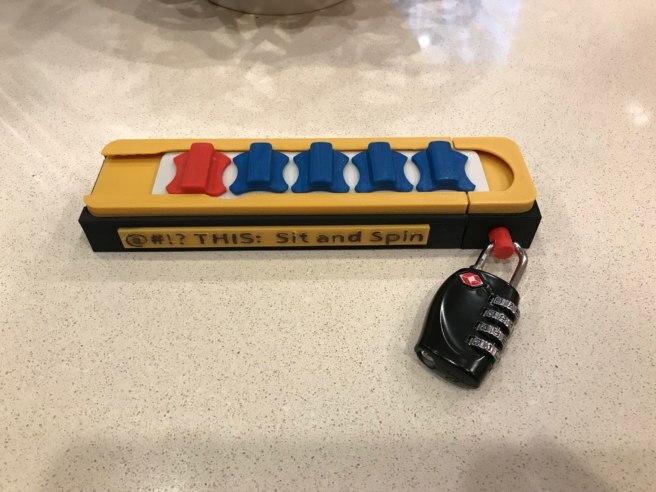 Figure out how to work the screen and the combination to the lock will appear.